Preserves stretch out your summer garden produce into winter. Would you like an easy, money saving way to enjoy the variety of tastes and textures in your food at any time of the year? Yes and please and thank you very much. You can make vegetable preserves from your home grown produce by canning, freezing or dehydrating them, allowing you to use them in a whole range of ways. I recall during my childhood watching my mother prepare and preserve a huge range of fruits and vegetables so we could use them during the winter months. Although produce fresh from the garden is wonderful; tomatoes for instance can be canned for use in soups and sauces or dehydrated for use on sandwiches and salads, months after being pulled off the vine. There are three fundamental ways for preserving vegetables: Canning — or bottling as it's called in some parts of the world; freezing and drying. Freezing Vegetables is the quickest and simplest way to preserve vegetables in their natural state. You don't need any special equipment to do this successfully. Vegetables will need to be blanched before freezing. This will maintain the colour and flavour of the vegetable you are preserving. Not all vegetables are suitable for freezing. Have a look on the Freezing page for all instructions and to check which are the most popular vegetables to make preserves that way. Canning or Bottling is another popular way to preserve vegetables. This uses heat and pressure to seal containers until reopening. 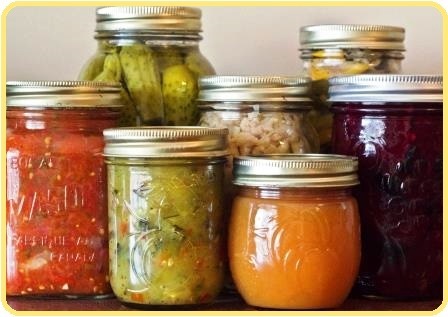 Canning is quite an exacting form of preserving food but it is also the most versatile. You can preserve produce in its original form, or you can mix it up and change it fundamentally, as with pickling. There is specialist equipment required like a pressure cooker and preserving jars, so expect some set-up costs, unless you know someone who already has the gear. Purchasing a specific reference book for canning is the best and safest way forward for this form of preserves. Follow these easy directions for How to Make Herb Vinegars. Drying or Dehydrating Food is probably the oldest form of preserving vegetables and other food. It can be done at home with little or no specialist equipment. You just need time and heat to get a great result. The big benefit of dehydrating food is that it can be stored very economically and reconstituted at will. To dehydrate herbs, see our special article Drying herbs. Some vegetables don't want you to do anything at all. Many of the root vegetables such as carrots, turnips, potatoes and onions will store just fine in a cool, dark place. A shed, a garage, a root cellar or just a cupboard will do fine as long as they are protected from light, heat and frost. Air circulation is also an important ingredient to keeping them in good condition for months at a time.